The runaway international bestseller is now an American must-read for lovers of adventure, travel writing, and romance. Corinne Hofmann tells how she falls in love with an African warrior while on holiday in Kenya. After overcoming severe obstacles, she moves into a tiny hut with him and his mother, and spends four years in his Kenyan village. Slowly but surely, the dream starts to crumble, and she hatches a plan to return home with her daughter, a baby born of the seemingly indestructible love between a white European woman and a Masai. 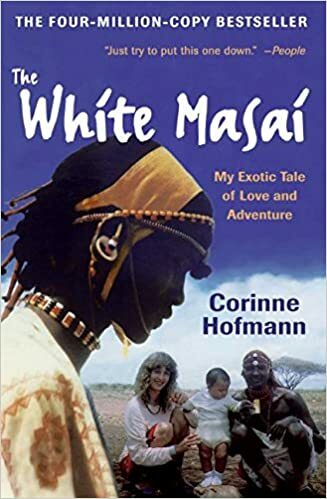 Compulsively readable, The White Masai is at once a hopelessly romantic love story, a gripping adventure yarn, and a fine piece of meticulously observed social anthropology. about the mosquitoes. He has fewer problems in his well-built house and makes do with a spray. He says the best thing would be to build a house: it wouldn’t cost much and the local government man could allocate us a piece of land which we’d then have to register in Maralal. I can’t get the idea out of my head: it would be tremendous to have a properly built hut. Taken with the idea I go back to the manyatta and tell Lketinga, but he’s not so sure. He doesn’t know if he’d feel at home in a house. wheel for the trip to Maralal and as always when my husband is with me, the trip is uneventful. We’re able to book a lorry for the next day already. In the boarding house I count out the money that Lketinga has brought and to my horror find we’re several thousand Kenyan shillings short of being able to pay for the load. I ask Lketinga about it, and he just says he left some behind in the store. So there’s nothing for me to do but draw more money out of the bank instead of paying in our profits.